第01章原付ライフShow posts in this category. 第02章教習所ライフShow posts in this category. 第03章相棒探しライフShow posts in this category. 第04章ミ・エスト蜜月ライフShow posts in this category. 第05章ミ・エスト・ミオメンテナンスライフShow posts in this category. お店での整備記録Show posts in this category. エスト乗りの小技集Show posts in this category. ケミカルShow posts in this category. ミ・エスト・ミオメーター記録ライフShow posts in this category. ミ・エスト・ミオ燃費記録ライフShow posts in this category. 日々のメンテナンスShow posts in this category. 磨き道Show posts in this category. 第06章ミ・エスト・ミオツーリングライフShow posts in this category. 富士山Show posts in this category. 長野Show posts in this category. 山梨Show posts in this category. 群馬Show posts in this category. 茨城Show posts in this category. 新潟Show posts in this category. 栃木Show posts in this category. 東京Show posts in this category. 神奈川Show posts in this category. 埼玉Show posts in this category. 千葉Show posts in this category. 宮城Show posts in this category. 山形Show posts in this category. 岩手Show posts in this category. 福島Show posts in this category. 3大天空回廊Show posts in this category. 中通りShow posts in this category. 会津Show posts in this category. 浜通りShow posts in this category. 秋田Show posts in this category. 青森Show posts in this category. 三重Show posts in this category. 愛知Show posts in this category. 静岡Show posts in this category. 奈良Show posts in this category. 滋賀Show posts in this category. 京都Show posts in this category. 大阪Show posts in this category. 福岡Show posts in this category. 佐賀Show posts in this category. 長崎Show posts in this category. 大分Show posts in this category. 熊本Show posts in this category. 宮崎Show posts in this category. 鹿児島Show posts in this category. 2017年初秋旅　北海道　9/23-9/30Show posts in this category. 2016年初夏旅　北海道　6/24-7/2Show posts in this category. 2015年晩夏　九州　9/14-22Show posts in this category. 2015年夏旅　東北　8/6-8/9Show posts in this category. 2014年初夏　北海道　6/27-7/5Show posts in this category. 2013年夏旅　岩手、秋田、福島　9/6~9/10Show posts in this category. 第08章ミ・エスト・ミオ講習ライフShow posts in this category. 第10章ミ・エスト・ミオ超絶自分恍惚写真館Show posts in this category. 定点撮影Show posts in this category. 静岡県Show posts in this category. 宮城県Show posts in this category. 秋田県Show posts in this category. 千葉県Show posts in this category. 東京都Show posts in this category. 長野県Show posts in this category. 第11章ミ・エスト・ミオ事故と交通安全ライフShow posts in this category. 今日の通勤事情Show posts in this category. 第12章ミ・エスト・ミオのエスト並べる写真館Show posts in this category. 目次・都道走破一覧Show posts in this category. 主要地方道1‐99Show posts in this category. 特例地方主要道301-Show posts in this category. 特例都道401‐Show posts in this category. 番外・首都高Show posts in this category. 第14章ミ・エストのウルトラソウル！ハ～イッ！Show posts in this category. エストレヤ全モデル図鑑Show posts in this category. 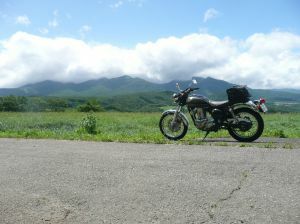 バイク全般Show posts in this category. バイク駐車場を探せShow posts in this category. ミ・エスト・ミオお役立ちグッズShow posts in this category. 物欲バイクライフShow posts in this category. 街で見かけたバイクShow posts in this category. 訪問者様の愛車紹介～Show posts in this category. がち山登りShow posts in this category. ゆる山歩きShow posts in this category. 山ごはんShow posts in this category. 山のお道具箱Show posts in this category. 旧街道そぞろ歩きShow posts in this category. 渓谷・湿原歩きShow posts in this category. MTShow posts in this category. PCソフトShow posts in this category. WPShow posts in this category. ぐるめShow posts in this category. 激辛道Show posts in this category. 簡単レシピShow posts in this category. ディズニー！Show posts in this category. バイクじゃない旅Show posts in this category. ビーズShow posts in this category. 今日の写真Show posts in this category. 夕焼けShow posts in this category. 今日の多摩川Show posts in this category. 今日の戦利品Show posts in this category. 今日の日記Show posts in this category. 今日の猫Show posts in this category. 今日の言葉Show posts in this category. 今日の馬Show posts in this category. 気になるあれこれShow posts in this category.